What is the whole purpose for cutting/bobbing a Fruitless Mulberry tree? Does it allow the tree trunk to get bigger? Or, does it actually help maintain (somewhat) the size of the trunk from getting so massive? By doing that it actually puts tbe whole growing focus (the strength energy) on the tree's branches and leaves. That would be my guess-timation anyway. I'd greatly appreciate some feedback. Pruning helps keep plants, including trees, not only healthier but more manageable in size. 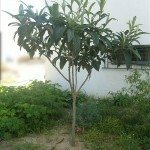 While all plants have different pruning times and requirements, this does aid in focusing energy to other parts of the tree, such as new leaf growth or even root development for those newly planted.